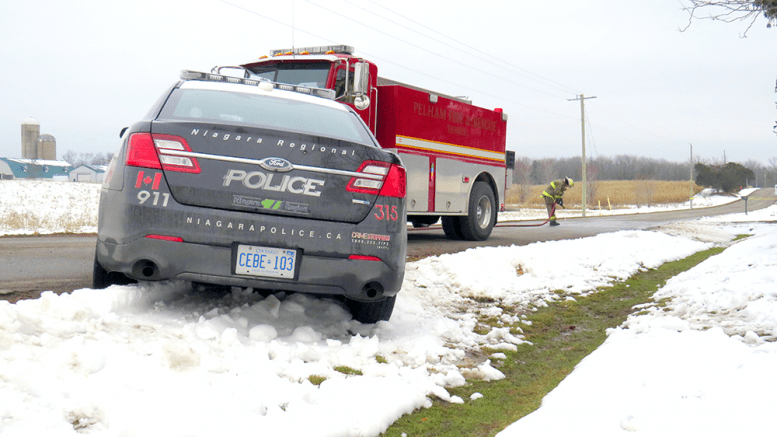 At the request of the Ontario Provincial Police, the Pelham Fire Department responded on Friday afternoon, Nov. 30, to the scene of a shooting that occurred some 24 hours earlier near the intersection of Effingham Street and Roland Road, in North Pelham. The Hamilton Spectator reported Thursday evening that NRPS Det. Sgt. Shane Donovan fired as many as five shots, hitting fellow police officer Const. Nathan Parker. Unconfirmed witness reports to the Voice had Parker wearing a regulation bulletproof vest, and being hit in the leg, chest, and face. The shooting followed an argument that escalated into a fistfight, according to sources speaking to the Toronto Sun. A source briefed on the incident confirmed this account to the Voice. The area around the intersection remained closed to traffic for most of Friday, as the OPP conducted a forensic investigation of the scene. At approximately 2:45 PM, the fire company was called out to hose down the pavement near the incident. Two firefighters accomplished the task in about 10 minutes, washing bloodstained snow off the road between two NRPS vehicles that had remained at the scene since the incident occurred. The vehicles were those driven to the location by Donovan and Parker. An OPP officer on site said that the vehicles were due to be towed away shortly after the roadway was cleaned. Parker’s condition was upgraded from critical to stable on Friday afternoon.